It's been a few years since I've been active on the forums. I originally had the username "Calico5string" on this site, but was unable to get logged back in under that one, so I re-registered, and shortened up my user name! For several years I've had higher than desired oil temp's, particularly when towing. On a trip last year from SoCal to Flagstaff (in early September... still hot in the Dez), my oil sump temps were running around 242°F-245°F, a bit higher than I'd like to see for a sustained period. I'm pretty sure it's due to the fact that I'm running the Stealth twin-pump setup, however, the issue seems to have been exacerbated when I went to the 207°F thermostat a few years back. The temp that the PCM sees (at the HPOP reservoir) was slightly lower, but only by a few degrees. I pulled and replaced the factory cooler, hoping it was clogged or something (plus, it was 18 yrs. old, and the o-rings had to be shot...). But, it looked excellent, other than the old o-rings. I went ahead and replaced it with a brand new one... But that made no difference in the sump/HPOP temps. It's unfortunate that no one makes an "all-in-one" spin-on filter adapter plate for the 7.3, that has external connections for an external cooler/filter, etc. There are a ton of them out there for various other engines and filter combo's, but nothing for the 7.3 Powerstroke. HOWEVER, after much online searching and research, I finally found a remote filter base that accepts the stock FL-1995 filter, AND, a spin-on remote adapter/base, to go on in place of the stock filter on the engine. Both parts are made by "Hamburger's Performance Products" (part of "Trans-Dapt", a company that's been around a long time...). By combining those two items (remoting the stock filter back a bit), some hose, an oil-bypass thermostat, and, of course, a cooler... Voila! External auxiliary oil cooler system. It all tucked in very nicely, up along the left side of the block/pan. I doesn't hang down particularly low, so ground clearance shouldn't be a problem when off-roading. Also, I thought it important to keep the stock, FL-1995 filter in the truck, as they are readily available, and it's what works with the engine. Since I'm rolling on the road/out of town alot, I wanted the oil filter to be easy to find (every parts store carries a Powerstroke filter, in some brand!). I haven't towed with it yet, but just running around town/highway, I'm seeing a significant drop in running temps: 10-12°F at the HPOP (via scanner), 6-8°F in the sump (dash gauge). The cooler is a top-inlet/outlet, 25-row unit (made in Sweden) but I plan to up-size to a 60-row "Earl's" cooler (with side in/out) very shortly. The oil thermostat bypasses most flow around the cooler until the oil temp reaches about 200°F , then it begins to close and direct the flow to the cooler (fully closed by 205°F). 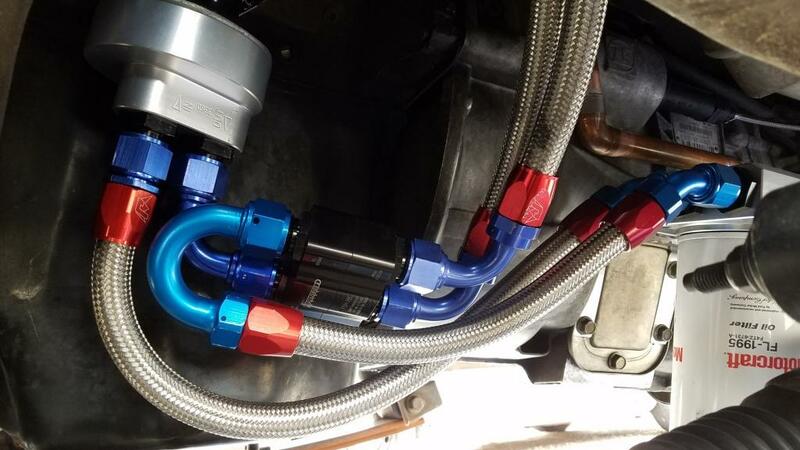 All the hoses and fittings are -12 (3/4") size, so as not to restrict any flow. 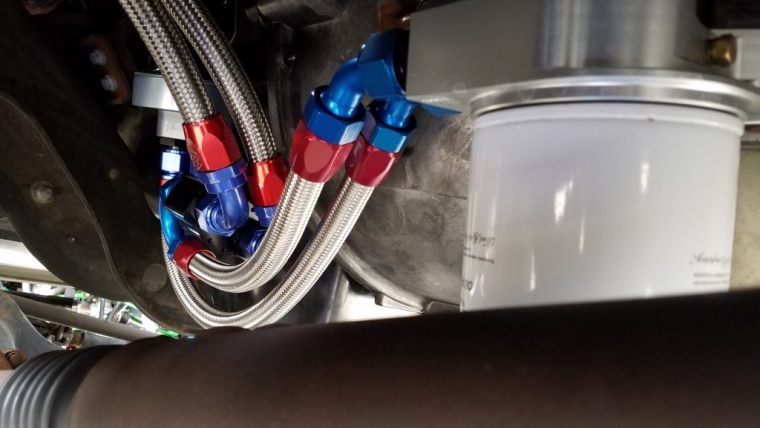 Originally, I had planned to use basic "1-wire" hydraulic hose & fittings for the plumbing, but the selection of hose-ends is much better with the S/S-braid "race" hose. Yeah, it's a little "blingy", but kinda cool at the same time. Plus, since the fittings are anodized aluminum, they won't rust/corrode over time, as traditional plated steel hydraulic fittings might. The oil filter base is mounted on a fabricated S/S bracket, bolted to the PTO cover on the trans. The cooler is mounted to the lower core-support member (although that will change when the bigger Earl's cooler goes in). Last edited by Calico5; 09-09-2018 at 09:42 PM. That is a very professional looking upgrade!! I expect to see it someone copy and try to sell it soon. Very nice setup. Clean looking install. 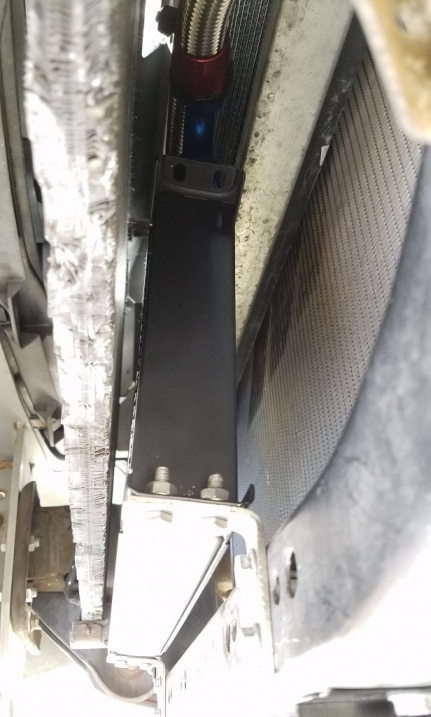 I cant believe you have not seen a bigger drop in temps even while not towing. I cant believe you have not seen a bigger drop in temps even while not towing. Cant really beat liquid to liquid for efficiency. But you really don't have anything to worry about unless your oil temps get up to 300F or so. Even at 250F you aren't really hurting your oil (or your engine). Like 79jasper said, a liquid to liquid cooler is way more efficient than liquid to air. Don't forget, the thermostat opens at 200, so temps will always be above that. Also, the 25-row SUSA cooler is just not big enough, IMHO. Once I get the trailer on, that'll be the test! And getting the larger 60-row "Earl's" cooler on there will make a great difference, I'm certain. I know 240-245 is not THAT hot, for modern engine oil. But, cooler is always better. My experience with industrial engines and hydraulic systems makes me lean towards keeping everything around 215-230. Oil life begins to drastically shorten once temps reach into the 240 range and above. Even modern synthetics, while much tougher than their predecessors, will begin to degrade much faster as the temperature increases above 240. In the last 30 years of wrenching, I've been through hours and hours of trainings and seminars, on industrial engine and hydraulic systems, and this is what I have gleaned from that. And yes, liquid coolers are more efficient, however, in the end, it all ends up in the air (since this isn't a boat!). Anyway, thanks for the positive feedback. I appreciate it. Time will tell as to how well it works! Last edited by Calico5; 09-20-2018 at 10:39 PM. A suggested improvement. Move your oil cooler to below the radiator. That will put it down into the airstream when at speed and put the radiator's performance back where it was before getting hot air from the oil cooler. The small (IMO) downside would be a bit worse oil cooler performance at low speed as the fan wouldn't draw air thru it. You might check both ways and see which configuration gives you better overall performance. The injectors orings don’t like high oil temps. The internal ones. Did you ever swap back to the factory 190-192 thermostat? So far, I haven't seen any change in the coolant temp... and yes, I am still running the higher-temp 203 'stat. However, I'm really thinking I may pull it out and go back to the 195/197 'stat also. Just to be clear you added a water temp sensor? The pcm readout is false. Ya the 203 thermostat usually raises oil temps 10 degrees. It doesn’t do anything beneficial. No, I did not add a water temp sensor. On my truck, the factory ECT sensor is not monitored by the PCM (no PCM input), it only feeds the dash gauge. While this is not a super accurate reading, it does indicate relative temperature, and it is an analog reading, not an on-off sensor like the oil pressure gauge sender. My oil temp is a sump-temperature reading. It is sensing in a port I added to the front oil-cooler header (while it was off for rebuild). I reads the oil temp leaving the pump. The port near the filter (on the rear oil-cooler header) reads temp post cooler, but the more important reading is the highest temperature, which is the sump (pan) temp. As far as thermostat rating: Supposedly, the higher coolant temps help with combustion efficiency (according to the sales-pitch, LOL). If you have an efficient radiator/cooling system, then the how "hot" the coolant is really doesn't matter. Heat loss in the radiator is about BTU's, not temperature. Whether you're getting rid of the heat at 180F of 210F (at a given load) doesn't matter, it's still the same AMOUNT of heat (in BTU's). Maybe I am not understanding this but wouldn’t the EOT be higher in an engine with a 203* T-stat than an engine with a 192* T-stat? Since the oil cooler is cooled by the "cold" side of the radiator/cooling system, then theoretically the oil temps would be stable regardless of the cooling system temps (providing your cooling system was efficient). Of course, an increase in ambient temps decreases the delta-T across the radiator, which increases the "cold" side temps a bit, which increases the oil temps. Also, the internal temps of the engine are higher with a 203 T-stat, so then the oil temps are higher within the engine and sump, and since the factory oil cooler can only take away "X" amount of heat, the overall oil temp is increased. Also, I'm running a dual HPOP system, which are known to increase oil temperatures. This is the whole reason to add the additional, external oil cooling: to augment the factory cooler, and keep the temps down under sustained load. If there was an easy way to increase the size of the factory liquid-to-liquid cooler, that would be optimal. But that's not really possible, so adding an external fin-type cooler is the next best thing. It’s proven the 203* just raises temps with no additional benefits. I would definitely fit the oem thermostat and drop temps. I've heard/read nothing negative... although [granated] the positive is somewhat of a sales-pitch. According to a popular website, the "original" T444e engines used the higher temp T-stats, but changed to the lower 195/197 'stats in the mid 90's. Again, if your cooling system is in good shape, there's no harm in running a few degrees hotter, IMHO. Oil is another story. While you definately want to run above 210-212, once the oil temps start approaching the 240's, oil degradation is accelerated. Last edited by Calico5; 09-23-2018 at 09:44 PM.